Creating in a Steampunk style can become quite addicting - of course there are common elements - Victorian era people, mechanical drawings, machines with gears and cogs, but there are limitless possibilities, and you can let your inner mad scientist run wild and use old stodgy Victorian images in a fun and imaginative way. 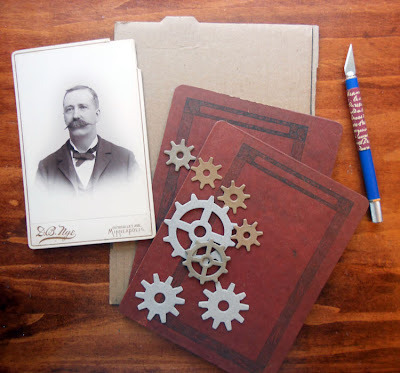 I like to collect “bought ancestors” when I visit antique shops - you may be more familiar with these as cabinet cards. It’s so much fun to imagine stories about their lives and this project has evolved from my love of those images as well as my enjoyment in creating altered books. You could absolutely make this project using an actual book, but for those out there that are a little intimidated by cutting into an old book, here’s a way to make a faux one! 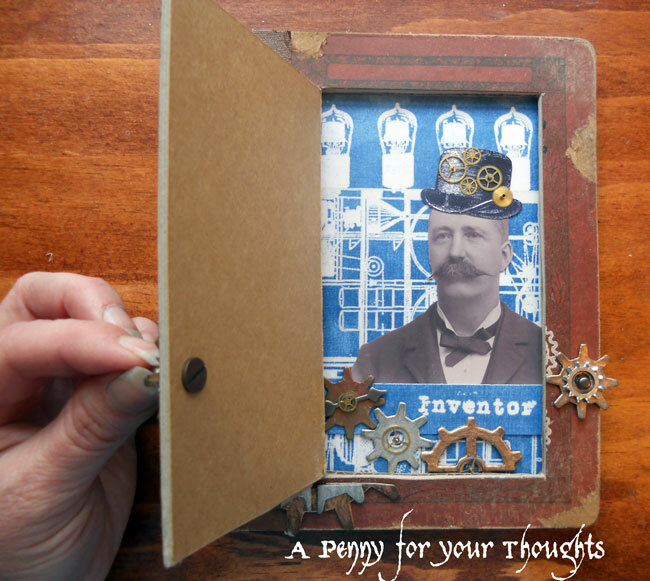 I’ve made my entire book into a niche, essentially giving you a shadow box to work with. 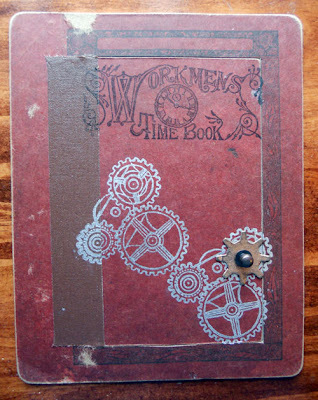 To start, I used one of my cabinet card images which I scanned and printed onto cardstock and cut out, two 7Gypsies book covers, a scrap of corrugated cardboard to create the depth and mimic book pages, die-cut chipboard gears, and a knife. These particular covers have a nice border that outlines a rectangle. 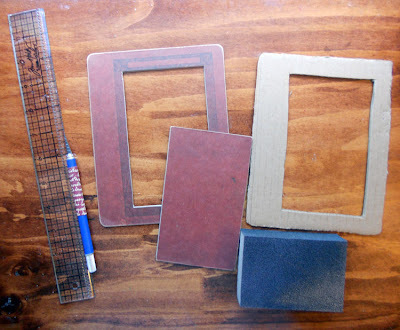 After cutting out the center rectangle from the top cover, sand the edges of the opening and the rectangle piece with a sanding block to allow it to slip back into the opening easily. This piece will become the door. 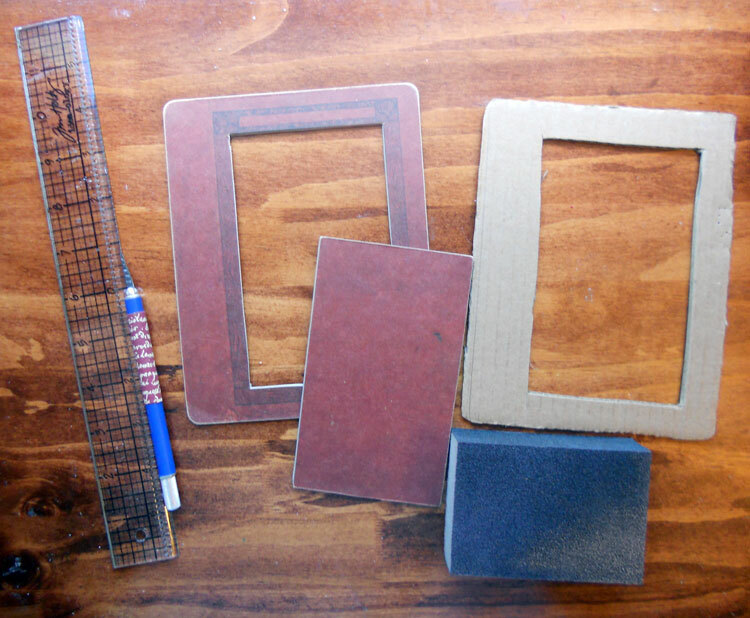 Also cut the corrugated cardboard to just slightly smaller than the cover and cut out the center rectangle shape to match the one you just cut on the cover. To alter the chipboard gears, first color them with Krylon pens, then sand the surface to scuff them. After highlighting the scuffs with Distress Stains you get a really nice worn look. 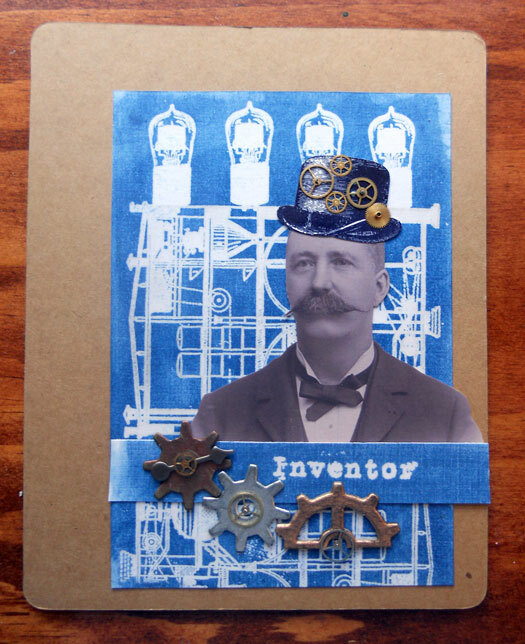 I wanted to have a blueprint background for my inventor - complete with light bulbs for his bright ideas! I used Oxford Impressions stamps to stamp a collage background with Versamark onto white cardstock, then heat embossed with clear embossing powder. 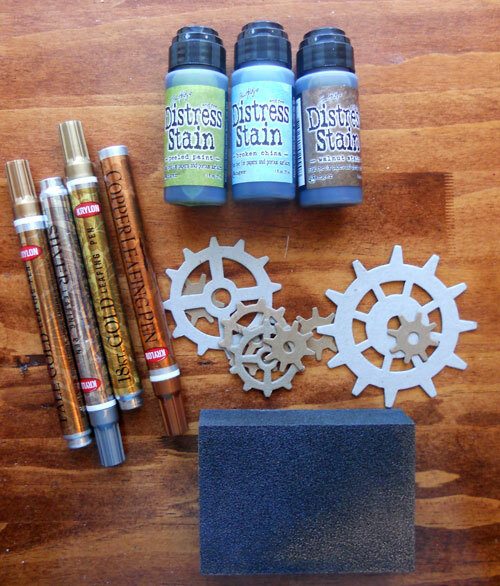 A little bit of Faded Jeans Distress Stain and you achieve a great blueprint look. Now to build the collage. Starting with the inside of the back cover, adhere the blueprint background checking its placement by laying the corrugated cardboard over it like a frame. Then I added my inventor, his stamped hat (Oxford Impressions), a text strip made the same way as the blueprint background, and some of the altered chipboard gears. 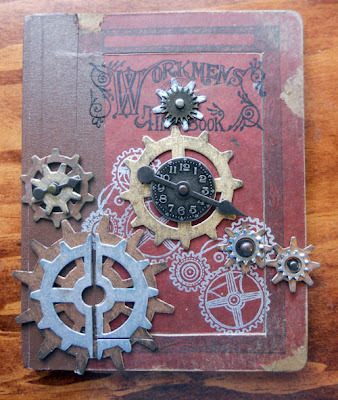 Then I placed tiny watch gears and a game spinner over top of those and just had to add more of the tiny watch gears over his head so you can see his brain working away! With the inside collage complete, adhere the corrugated cardboard piece over it. Now to the front cover. 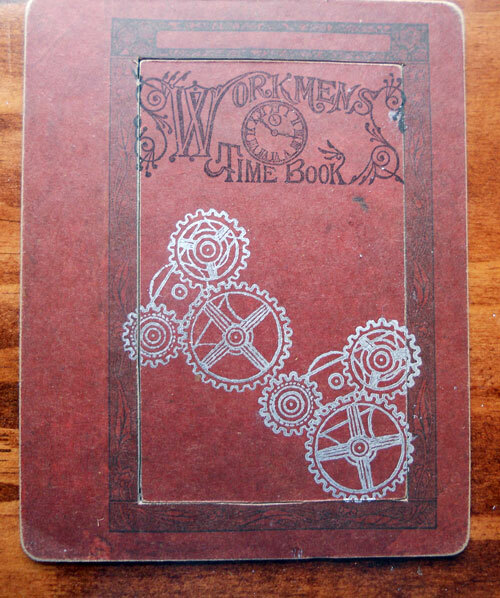 With the cut out rectangle in place, stamp images (Oxford Impressions) onto the cover. 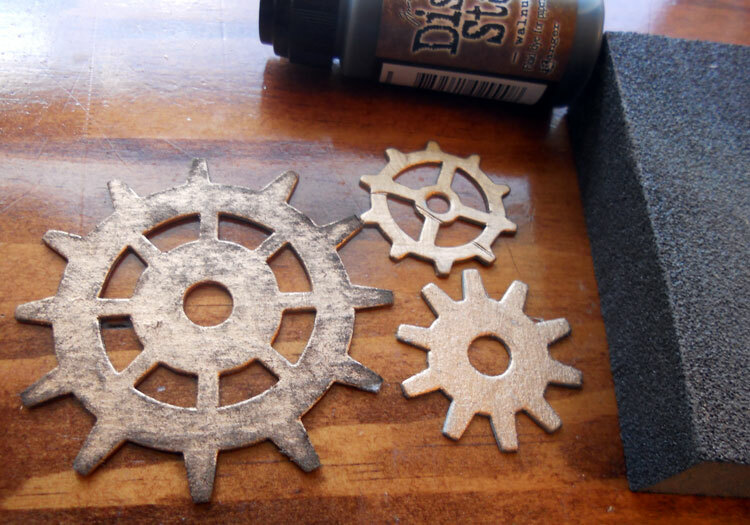 Take out the center rectangle, punch a hole and add a chipboard gear, washer, and hitch fastener creating a doorknob. Once the door is back in place, add a piece of gaffer tape only the length of the opening. You can see I had to re-stamp a little bit onto the tape to replace the bit of stamping it covered. You could certainly add the tape before stamping to avoid that. 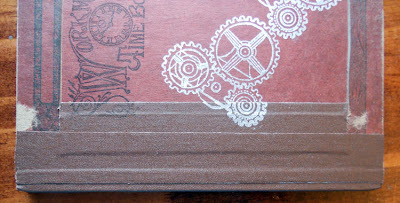 I also started scuffing and peeling parts of the cover so that it looked worn and well-used. Now adhere the top cover to the base you’ve already created then add more gaffer tape to the spine giving your book its binding. Finally add the altered chipboard gears to the cover. I wanted a large one in the lower left corner, and needed to cut it along the border of the inner rectangle to allow the door to open. 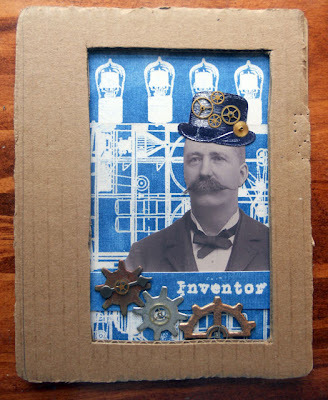 ...which you can now open to reveal the inventor! Love the journal cover and the blueprint look! That is SO COOL! 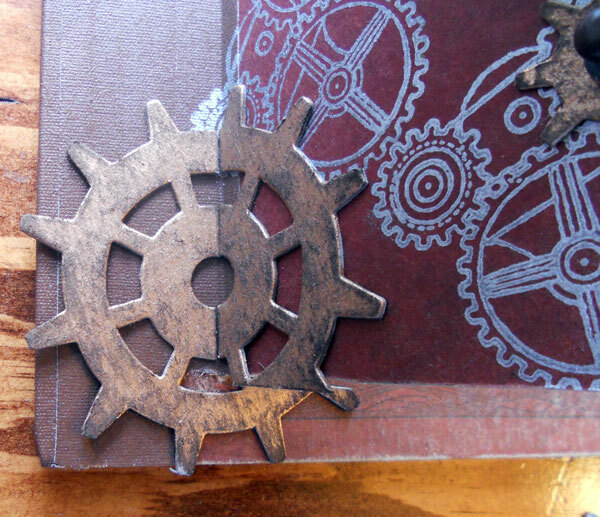 I thought it was a real book and the chipboard gears looked so real too. The blueprint was genius and the tutorial was excellent. Thanks for this wonderful project, Penny! An astonishing project. 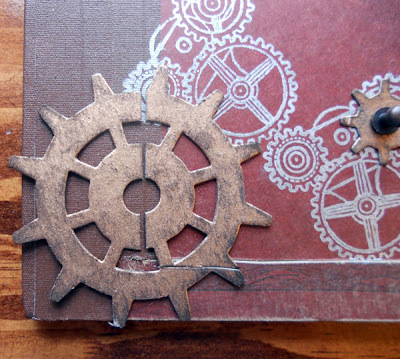 Penny has created some of the best Steampunk artwork I've seen these past weeks. 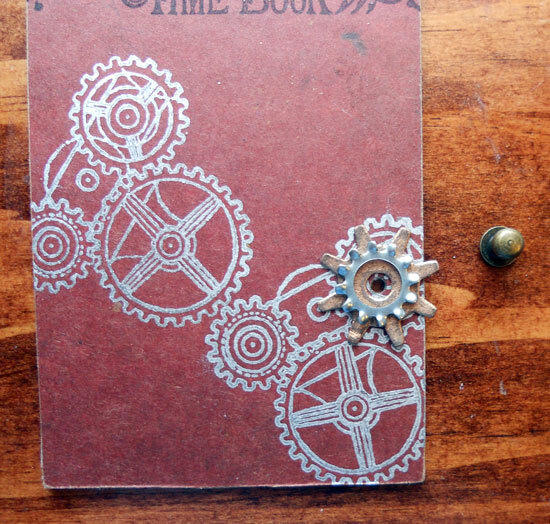 Beautiful notebook Penny, thanks for sharing how you made it. Not a a style I am normally into but I LOVE this project! Great job. 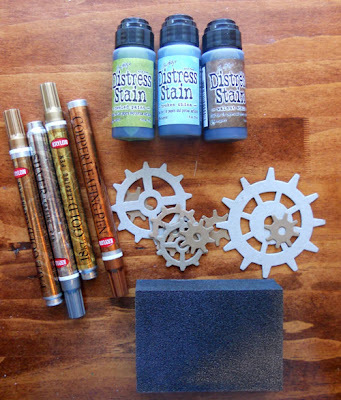 I might have to try some distressy projects now! WOW, this is totally gorgeous!!! Wow! What a great look you've prepared! A favorite of mine would be that "Blueprint" idea!!! Fabulous!!!! Thank You for the tips and tricks you've offered! They look like a ton of fun for me to try on at some point. 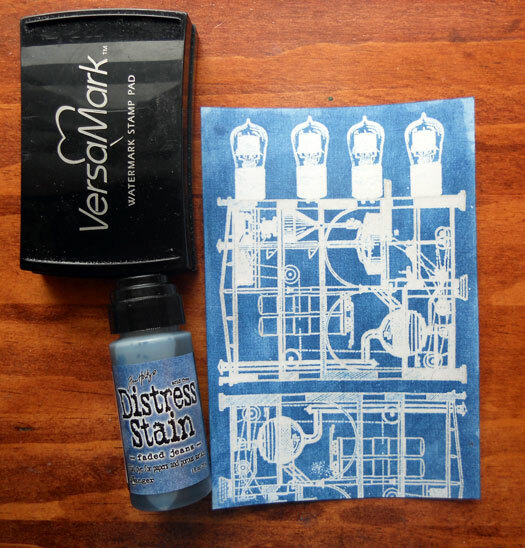 Time for my first Versamark pad too. Awesome project!!! Love the blueprint!! Brilliant! Pawed through my stashed, and I have those book covers!!!! Thanks for the inspiration! I love this! And I so appreciate the instructions-many thanks. I can't wait to make a few of these! Wonderful, wonderful project. Thanks for sharing. Fabulous book, wonderfully done!love the blueprint idea!